Last night, the San Francisco Giants forced a Game 7 in the NLCS by soundly beating the St. Louis Cardinals 6-1 at home. 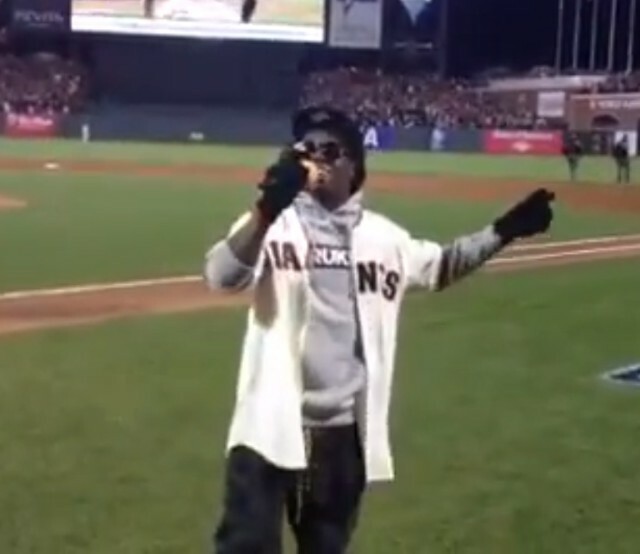 And San Francisco fans also had something extra to be amped about: During the seventh-inning stretch, Lil Wayne showed up to sing “Take Me Out To The Ballgame” in a manner so melodically questionable that I can’t help but make a Roseanne Barr reference. Watch the carnage below. Yahoo Sports reports that Wayne got booked because he’s acquaintances with Giant Ryan Theriot, and even Theriot wasn’t terribly impressed: “Well, I heard it. We’re going to have to talk about the melody just a touch, a little bit. Know what I mean? His teeth looked good.” Also, James Hetfield gave the crowd a pre-game pep talk.